The story of Brexit since the referendum vote has so far been that of a stalemate. There are two major factions in the British elite: those that see a strategic interest in remaining with the EU, and those who forecast the EU’s decline and thus believe that Britain is better abandoning a sinking ship sooner than later. The current situation with regards to Brexit can be boiled down to a simple fact: neither of these two factions so far currently holds the resources to defeat the other. The drafters of the Brexit deal were caught in this equilibrium between both sides. Hence the absence of a deal that would enjoy widespread support is at its core not so much a product of the failures from Theresa May’s team as it is a product of the current political environment in Britain. This is primarily why Theresa May won the confidence vote after the deal was rejected: there was little else another leader could achieve in her place. Thus, there was insufficient will from either side to take responsibility for a new attempt. This stalemate is also the reason why a second Brexit referendum is not going to be held. There is simply no consensus between both sides that would gather the critical mass of support for such a decision. Brexit will come to be. At the moment, their primary aim of both elite factions is to buy themselves time until an external trigger distabilises the current equilibrium between them. Such a stalemate in the showdown between two elite factions is not only present in the UK. It is the case in the US, in mainland Europe and even in Russia. In all these cases, we can distinguish a liberal elite that favours integration under the current globalized order and another faction that believes the current system is not working sufficiently in its favour and needs therefore needs remoulding. All parties are waiting for an exogenous shock to undo this stalemate at the expense of crisis elsewhere that will alter the resources they each have available in their struggle. This is much preferable to an endogenous shock that may resolve the stalemate, but would be much costlier for the elites involved. One may recall how European powers preferred to settle their disputes in the 19th century based on the outcome of conflict in the colonies rather than direct conflict on the European peninsula, except this time the dispute is internal rather than inter-state. A no-deal Brexit would cause the kind of internal destabilization to the country that the British elite as a whole seeks to avoid. This scenario would certainly bring high costs, and would upset the domestic political scene, while at the same time it is highly uncertain in whose favour it would tilt the balance. This high uncertainty is unattractive to both sides of the political elite. 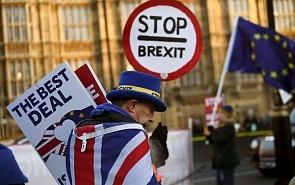 Unless a sudden crisis outside of Britain in the next two months significantly alters the resources available to each party in their showdown, the British parliament is headed for approving a Brexit deal before March 29. The swing vote will likely be held by those elites that believe remaining in the EU is currently the best strategic option for Britain. This group generally voted down May’s deal because they thought amendments were necessary and can still be won from the EU. Yet if it comes down to choosing between no deal and a poor deal, they are most likely to pick a poor deal that would nevertheless mitigate the adverse economic and social consequences of leaving the EU, and, most importantly, buy time.